Cute wallpaper pattern of a sky full of clouds. Removable wallpaper is a playful way to complete a room. At Canvas On Demand, we offer a customizable experience from beginning to end, so we know you’re going to love your new wallpaper! Each design we offer can be customized in both its scale and color scheme to match your personal décor, or you can simply stick with the design, as is. Canvas On Demand designers are constantly adding new designs and patterns to our growing collection to ensure there’s a perfect wallpaper in every room of your home or office. Whether you’re looking for a bold pattern, a subtle touch of color, or a mixture of both, our selection of Removable Wallpaper has just what you need to make your space look its best. This wallpaper can be quickly installed without the need for professional installation or any adhesive. Simply remove your wallpaper from the tube it ships in, and unroll it before peeling the backing and applying it to the wall. Take care to smooth out any air bubbles or wrinkles as you apply it to the wall. To make the wallpaper look seamless, line up the pattern as you install your temporary wallpaper. 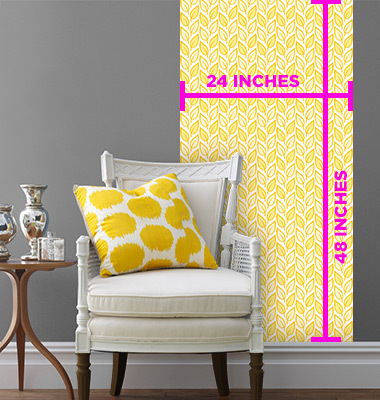 Your selected temporary wallpaper design will be printed on high quality adhesive paper that won’t damage your walls or remove paint that’s been cured for 30 days or more. Temporary wallpaper works best on smooth walls, and is recommended for rooms with very little moisture or humidity. Removable wallpaper is meant for temporary use but may last years if installed properly on smooth, cured walls in rooms where moisture will not reach the wallpaper. Each wallpaper panel measures 24” x 48” and the patterns repeat 2-3 times per panel, depending on the design chosen and the scale selected. Though temporary wallpaper is simple to install, we highly recommend ordering an extra panel or two in the event of any unexpected mishaps during installation. When you are ready to remove your removable wallpaper, simply peel it off your walls. Your wallpaper will come off the wall without leaving any residue behind. And because it’s affordable and easy to install and remove, you can switch up your wallpaper as much as you like without fear of damaging your walls! Temporary wallpaper looks great in offices, as an accent wall, or nearly anywhere in your home. Renters love removable wallpaper because it allows them to change up their walls without painting or worrying about damage when they move out. It’s also the perfect way to decorate a child’s room because removable wallpaper can easily change with their growing interests and tastes. Removable wallpaper is just what your walls have been missing!